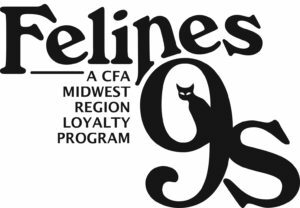 To encourage entries at shows in their region, CFA's Midwest Region is now offering a loyalty reward program called Feline 9s. After nine paid entries in Midwest Region shows, the Region will pay you a rebate of $50 for your 10th entry. For example, if you enter four cats in one show and five cats in the next show, your tenth entry is paid by the region up to $50. Then you can start all over again. It begins with the Hawkeye State Show at Altoona on February 11, 2017 and will run until December 31, 2017. All exhibitors, regardless of their home region, who are entered in Midwest Region shows are eligible. 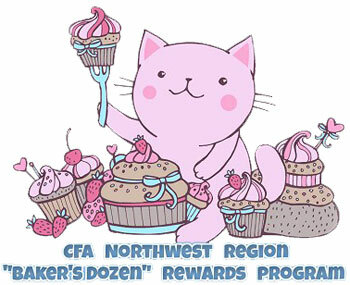 Inspired by the Feline 9s program, CFA's Northwest Region have instituted their own reward program to encourage entries in Northwest Region shows, customized to their regions differences. In the “Baker’s Dozen” program, for every 13 entries made to shows in the Northwest Region, the Region will pick up the tab for the 13th entry by issuing a $50 rebate. The “Baker’s Dozen” recording period will begin retroactively, and will cover the period from January 1, 2017 until December 31, 2017. All exhibitors, regardless of their home region, who are entered in Northwest Region shows are eligible. Kudos to the Midwest Region and the Northwest Region for thinking about a new way to show their appreciation for the exhibitors who support the cat fancy and CFA at the shows in their regions.